One of the most common mistakes in genealogy is falling into the trap of the same name syndrome. Latching on to the wrong ancestor does not only grow the wrong kind of family tree but is also a source of many a migraine headache when others are trying to untangle the entwined lines, it is near impossible to saw off one of those limbs that have grown into your tree. I have run into this in a number of lines I am researching; John, Thomas, Charles, George, and Gideon Gibson, John, David, and James Collins. These are a few of the tangled trees I will try to take on but thought I would first start with my own line; Ezekiel Gibson. A descendant of my ancestor, William K. Gibson, born 1814 in North Carolina matches the DNA of descendants of James Gibson, son of Valentine, grandson of Thomas Gibson d. 1734 Louisa County, Va., who came from Stokes County North Carolina with his brothers Garrett and Archelous to Grainger County, Tennessee. This DNA match does NOT match the Gibsons known as Melungeons. Back in the 1980s when genealogy and the big world wide web was just a gleam in someone's eye, when we had to write letters and send them in the US mail and wait forever for a response, I corresponded with a lady in Morgan Co., Kentucky on my Gibson line. She was in her 80s and told me the Gibsons had came from Stokes or Surry County, North Carolina. After several letters requesting more information I received a letter from her daughter that she passed away, she had no more information but sent me the notes her mother kept on the family. There was no source. I found there were two Ezekiel Gibsons -- one apparently came from Wilkes Co, and likely brother of Archibald, later went to Floyd County. I strongly suspect they are sons of Major Gibson. This Ezekiel is found in Morgan, Ashe County, North Carolina in 1800 with Archibald and Joel Gibson. This record was posted to Genforum and I am still searching for the original deed but if this is correct that Valentine left his land to be split between "William and his brother Ezekiel" it would appear Valentine's sons, William and Ezekiel, were living in Stokes County, North Carolina in 1804 and were NOT in Kentucky. In 1820 there are three Ezekiel Gibsons on the census, two in Floyd County, Kentucky and one in Scott County, Virginia. It seems clear, to me at least, that Ezekiel Gibson of Surry/Stokes County, North Carolina has moved to Scott County, Virginia. 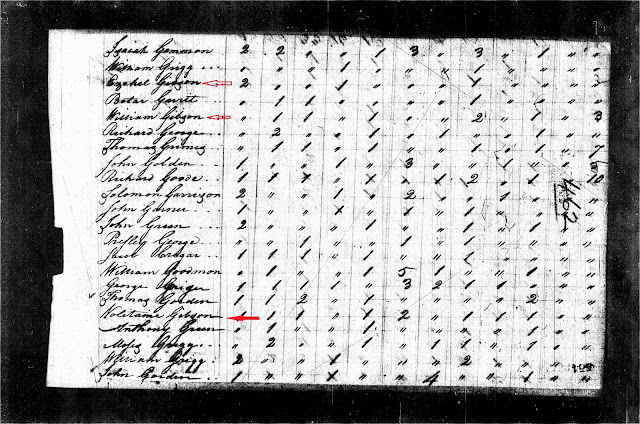 All records seem to indicate Ezekiel Gibson Senior of Floyd County was deceased before the 1830 census. We have two Ezekiel Gibsons, one still in Scott Co., Virginia while it appears Ezekiel Gibson, the younger, has followed Archibald Gibson to Hendricks County, Indiana. In 1835 William K. Gibson, my ancestor, married to Polly Gilliam in Scott County, Virginia. In the mid 1830s Ezekiel Gibson is on the Morgan County, Kentucky tax lists (Ezekiel the elder of Floyd was deceased and Ezekiel the younger of Floyd had moved to Indiana). William K. Gibson was married in 1835 and is living in Scott County, Virginia in 1850 but by 1854 he also had moved to Morgan County, Kentucky. Knowing that my William K. Gibson was born in North Carolina in 1814 and married in Scott County, Virginia in 1835 it seemed rather logical that Ezekiel of Scott County, Virginia., in 1820 was the same Ezekiel found in Surry Co, North Carolina in 1810, especially since William K., named his first son Ezekiel. Since Ezekiel appeared to descend from Valentine Gibson as they are on the same page in the census record, and finding Valentine named in the will of Thomas Gibson who died in 1734 I have been researching this Gibson family since 1988. It was not until just last year that Stephen Gibson notified me his DNA matched that of a descendant of my William K. Gibson. Stephen's DNA is solid back to Garret Gibson of Knox Co., Kentucky, son of James Gibson. I have a number records and notes on this family. Below are just a few notes, but I believe they prove, without a doubt, that James Gibson of Knox County, Kentucky came from Stokes Co., son of Valentine, grandson of Thomas Gibson died 1734 first to Grainger Co., Tennessee to Knox County, and Garrett Gibson is his son and a DNA match to my William K. Gibson. It has been rumored about for a couple of years that there is supposedly another descendant of Valentine Gibson's who has tested and does not match our Gibsons. To date no one from this 'supposed' line has posted his result online, listed the results at the Gibson DNA project or presented their documentation to Valentine Gibson, until they do it remains nothing more than a rumor. 1734, 29 Oct: p. 151 of Court record: In the Name of God Amen. I Thomas Gibson Sr., of St Martin's Parish, Hanover County, sick and weak but of sound mind and memory do make this my last will and testament. I recommend my soul to the hand of Almighty God and my body to the earth. After all my debts and funeral charges are paid I give to my loving son Thomas Gibson 50 a of land' to my well beloved son John Gibson, 50 a of land; to my well beloved daughter Nice Nicks wife of Edward Nicks, Frances Humphrey and Mary Brook on shilling each; to my well beloved son edward Nicks whom I do hereby constitute sole Exor of this my wil and testament my house likewise my stock of hogs and cattle together with all my estate goods and chattels moveable and unmoveable to enable him to bring up my children John Gibson, VALENTINE GIBSON, also William Robertson. I do hereby utterly revoke and make void all former wills and testaments by me at anytime heretofore made and I do hereby Ordain this ...and and befor and (?) as my only Last Will and Testament In witness whereof I have hereunto set my hand Seal this Twenty Ninth day of October Anno Domini 1734. THOMAS (his mark a cross) GIBSON (seal.) Signed sealed and delivered(?) his last Will and Testament In the presence of The mark of (ID) ISAAC JOHNSON the mark of (two crosswise strokes) JAMES PHILLIPS G. GILLINGHAM Schoolmaster. As Eunice, Mary, John and Thomas are mentioned first and they have grown children at the time of the will their births being many years before Valentine it would appear Thomas was married twice, and perhaps had two sons name John, one of age and the other still a minor. It has been *assumed* that Thomas Gibson who went to Orange County, North Carolina is the son of this Thomas Gibson Sr., however I believe Thomas Gibson Jr., left the area of Hanover/Louisa County before Thomas and George Gibson of Charles City County moved in. There is a Thomas Gibson of the right age living in Henrico County in 1756 who is more likely the brother of Valentine than the one who moved to Orange Co., NC. By the 1780-1790s James and Garret along with their brothers Archelous and John moved to Tennessee. Garret Gibson is a son of James Gibson of Knox County who went to Putnam County, Indiana and is ancestor of above mentioned Stephen Gibson. George Gibson of Putnam County, Indiana to Simon Collins of Hawkins County, $150, tract on Black Water Creek, part of a 300-acre tract granted by the State to James Johnson and Moses Humphrey, containing 50 acres more or less and witness by Vardy [his mark] Collins, Burrell [his mark] Sullivan and Morgan Collins. Jordan Gibson to Simeon Collins, of Hawkins County, $200, the west fork of Black Water Creek, part of a 300-acre tract granted to James Johnston and Moses Humphreys... a patent line south of Powells Mountain, Signed by Jordon [his mark] Gibson and witnessed by Vardy Collins and Alfred Collins. 1812 Member lst Baptist Church and met in his home. Lewis & Valentine members (GS#986465 - also known as Cumberland River Baptist Church. Home located at Lin Camp creek. He is also mentioned July 1813 and Aug 1815. 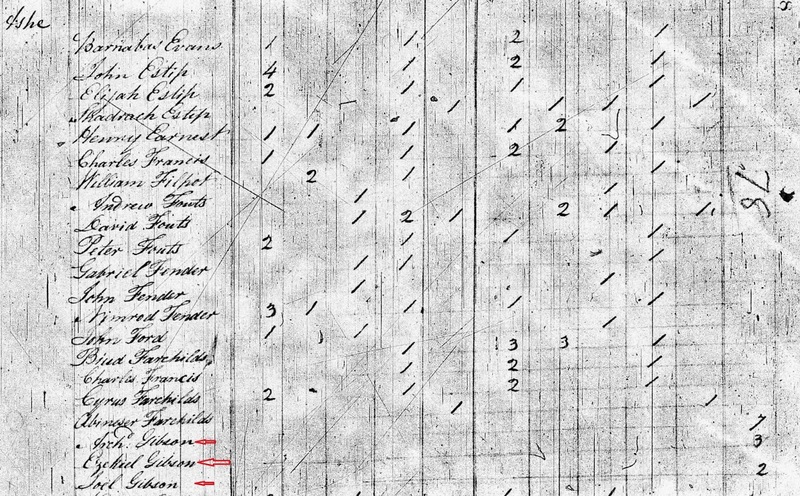 1820 Census Knox County On Little Poplar was James Gibson Sr., and Lewis Gibson while Major, Isaac, and Jesse were on Clear Creek, with Valentine Gibson on Stinking Creek. 4 Mar 1811 Garrett Gibson and Rachel his wife bought from Nathaniel Walker of same county and State of KY (Knox Co. Deeds Bk B p 140 FHL Film 532664) 400 A for $350 A on South Bank of Robinson Creek. He was then in Putnam Co., IN where he remained until 1831. He is on the 1830 Putnam Co., IN census along with Lewis, Arthur, George, Carmel. He then went to Carroll Co., IN until about 1841 (found there in the 1840 census) where he was involved with the Moore family over selling some land and giving clear title to it. It is believed he then went to IL for a few years before he is known to have died at the home of his son, Arthur Gibson in Buchanan Co., MO after 1850. 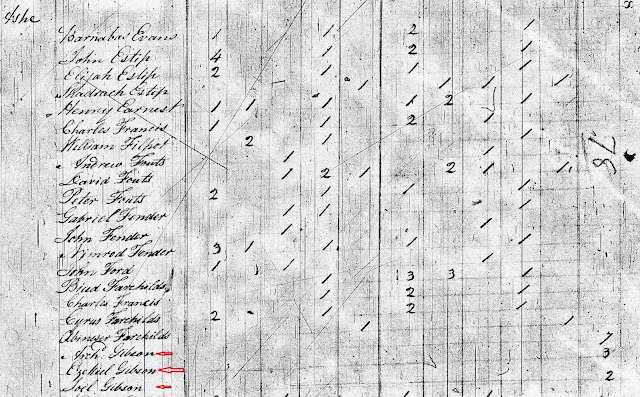 Mrs. Shreve did not find him in the 1850 census in Buchanan Co. From 1812 to 1819 he may have been in Lawrence Co., IL. Records of Irene Srieby Shreve-Lafayette Research (now deceased) stated he & Rachel m. abt 1805 in Claiborne Co., TN where records do not begin until 1837 but county was formed from Grainger abt 1802. Garrett and Aaron Gibson are found mentioned on early court records of Claiborne. It is believed he was the son of James Gibson who has been proven to have come from Stokes Co., NC to Grainger Co., TN about 1797 or before. Mrs. Shreve wrote "believe Lewis & Garrett had sons named James who lived in Putnam Co., IN and md there. One James Gibson d abt 1844 and some of his children went to Buchanan Co., MO where Arthur Gibson, his son lived as evidenced by deed records in Putnam Co., IN showing they were in MO when they sold land inherited from a James Gibson". Please contact me if you descend from either of these Ezekiel Gibsons. Pee Dee River as the CORE Melungeons. being in Colonial America dating back to 1492.
with deAyllon in South Carolina back to 1527.
documented as mixing with the Native Tribes in the 1500s. "One possible documented source of Portuguese ancestry may be from Juan Pardo’s men who were abandoned at various forts in present day North Carolina, one perhaps as far north and west as Morgantown, North Carolina. Some of Pardo's men may have been Portuguese. These men, if they survived, would have had to have assimilated into the Native population and have taken Native wives, as there were no European women available in 1566. However, the core Melungeon family group is not originally found in western North Carolina, but in eastern Virginia." Now I ask you why Jack Goins would call them 'my imaginary Melungeons on the Pee Dee River' last year when he has had them listed as CORE families since 2005? Why would he suggest they couldn't have been Portuguese because the CORE families came from Eastern Virginia when he has had the trial transcripts of the Hamilton County families that showed they were known as Portuguese and came from the Pee Dee River on his website since 2005? ''Sept. 5. Just as we were ready to take horse and march from the Sapiny’s about seven of the clock in the Morning we heard some guns go off from the other side of the River. They were seven Apomatack Indians sent by Major General Wood to accompany us in our voyage. We hence sent back a horse belonging to Mr. Thomas Wood, which was hired, by a Portugal, belonging to Major General Wood, whom we here found. About eleven of the clock we set forward and that night came to the town of the Hanathaskies which we judge to be twenty five miles from the Sapenys, they are lying west and by north in an island on the Sapony River rich land. ''( Read more here) This does not prove the Melungeons were Portuguese Indians but clearly we have a Portuguese man living at the Saponi town in 1671. In 1668 Surry County, Virginia Tax List at Sunken Marsh we find George - no last name- but with the notation; "he is a Spaniard." So if you have read 'they weren't Portuguese because they had English names' this is why they had English names, the same reason the other brown people such as Indians, Africans, Armenians, etc., did .... they didn't have surnames. The Gibson family which originated in Colonial Virginia is a large family, connected by "maybe, possibly and may have beens" over the years and now by records and DNA. It has been written and quoted and copied and pasted all over the internet that the Gibson family [may have] originated with Elizabeth Chavis yet records show Thomas Gibson, Jane Gibson [the Indian] and George Gibson were here before the Chavis family arrived. It was recorded that Thomas Chavis came to Virginia from Ireland in 1656 where he bought land that bordered the Gibson family. We know that he died and left two minor children that were bound out but we know nothing of his wife, the mother of Elizabeth and William Chavis. Although it cannot be proven at this point it is likely that Elizabeth, the mother of Gibeon/Gibson Gibson, was the Widow Gibson who married William Chavis before his death, which would account for her 'Indian' son being bound out. In Virginia, 1656, it was provided that Indian children brought into the colony as hostages should be assigned to masters by choice of their parents, but should not be made slaves. Again, in 1658, it was decreed that any Indian children disposed of by their parents to a white man for “education and instruction in the Christian religion”, or for any other purpose, were not to be turned over to any other person upon any pretext whatever, and any such child was to be free at the age of twenty-five. And on the 28th of March 1672 Elizabeth Chavis made a successful petition to the General Court of Virginia to release her son Gibson [Gibeon?] Gibson who had been unlawfully bound by Berr. Mercer to Thomas Barber who had gone to England leaving the boy with Samuel Austin [Minutes of the Council 1670-76, 106, Virginia Historical Society Mss 4V81935a2; McIlwaine, Minutes of the Council, 302-3]. Depositions entered into the court cases over the years document Jane Gibson [born 1640], an Indian woman, and her two children Jane and George. We know some of Jane's descendants were enslaved, some won their freedom and some were simply sold off into oblivion. See Chancery Court Records for more information and Descendants Chart. Not included in the charts but in the Court Records are; "SCOTTs, BRADBYs, SMITHs, REDCROSSes alias EVANS, MORRISSes alias EVANS, and in Henrico the BOWMANs, all descendants from the original stock of the GIBSON, to wit, Jane EVANS Daughter of Jane GIBSON. Perhaps DNA will be the key to connecting all these families but at the present we will have to be content with the few records we do have. This clipping from the Biography of General Randall Lee Gibson appeared in 1892. At that time Randall was survived by three of his siblings and one would presume they were consulted about his family history. Randall Gibson's great-grandfather was Gibeon/Gideon Gibson of the Pee Dee River, born in 1720 and died in 1792. From the article it would appear he descends from John and Elizabeth Wilcox/Wilcocks Gibson married 1707 in Middlesex County, Virginia. "Some of the people who have gone there, think now some of them should marry the women of the savages of that country; and he tells me that there are already 40 or 50 thus married." From the above letter it is documented by 1612 40-50 men had already intermixed with Native Tribes, and there were women also who apparently went to live among the Natives - many of those Natives would be carrying the Y-DNA of the Europeans and Africans DNA left behind from explorers; deAyllon, deSoto, and Pardo, etc. "Wherever these people are found there also will the traveler or investigator passing through their region encounter the tradition of Portuguese blood or descent, and many have often wondered how these people came to have such a tradition or, in view of their ignorance, how they came to even know of the name of Portugal or the Portuguese. The explanation is, however, far simpler than one might imagine. In the first place, the Portuguese have always been a seagoing people, and according to Mr. Mooney, who has looked up the subject, the early records of Virginia and the Carolinas contain notices of Portuguese ships having gone to wreck on the coasts of these States and of the crews settling down and marrying in with Indians and mulattoes. Moreover, there are records of Portuguese ships having sailed into Jamestown Bay as early as 1655, and since then there has been more or less settlement of Portuguese fishermen and sailors from Maine to Florida. Now it has been the history of the Portuguese race that wherever they settled they mixed in with the darker peoples forming the aboriginal populations of the countries occupied by Portuguese settlers, and this is the reason and cause of the Portuguese admixture among the tribes along the coast of the United States."